Slate Industry of North Wales is part of the Tentative list of UK in order to qualify for inclusion in the World Heritage List. March 2018 - In the afternoon we reached Snowdonia. Amazing Nationalpark and still covered in snow. All houses in the valleys were covered with slate and even the walls were made from slate. Certainly an important raw material in that area and we learned Wales is the biggest exporter of slate. We took a short hike along Dinorwic Workings and discovered the impact of the industry here. Next morning we still visited Bangor University. I don’t normally review sites from UK but, having just returned from a visit to the “Slate Industry of N Wales” T List site, I was surprised to note that it has not yet been reviewed at all. Since it is relatively easy to take in whilst visiting Gwynedd Castles and Pontcysyllte Aqueduct, WHS travellers might find the following info of use. Just as S Wales is synonymous with “Coal”, N Wales is significantly linked to “Slate”. In the 19th C, Welsh slate roofed the burgeoning housing of London and elsewhere in UK and was also exported around the World - peak production was around 1831-78. Nowadays only some small scale production continues. The 7 areas identified for possible inscription follow a pattern set by the Devon/Cornwall mining site WHS - a number of mines, together with some towns/villages, often in the form of a cultural landscape, a port and some railways. For good measure add a 19th C Industrialist’s stately home and a university founded for the working class. These are scattered across N Wales and you will have to decide where to put your time and effort! It is perhaps worth mentioning a couple of things about slate extraction – first it can be carried out “open cast” in quarries or underground in mines. Both are represented within the 7 areas – our choice was to see an open cast example. These are spectacular in size when viewed in terms of the technology available and the humans who created them. Having recently visited 2 WHS silver mines in Slovakia and Poland we didn’t feel the need for another underground trip! This may have been a mistake since the underground quarries contain huge caverns with lakes unlike the small tunnels of the silver mines! Second, the process of producing 1 tonne of good slate “tile” generated around 9 tonnes of waste. This latter was dumped on the hillsides so, as well as vast “holes” created by the extraction, you get enormous spoil heaps. We concentrated on “Welsh Slate Museum. Dinorwic Workings”. Dinorwic was the second largest quarry and is situated in the heart of Snowdonia just outside the honeypot location of Llanberis. Here walkers and climbers gather and the Snowdon mountain railway sets off up Wales’s highest mountain (a mere 1085 m high but not to be underestimated on some of its routes and in some weather conditions). The quarry’s 19th C engineering workshops have been turned into the “National Slate Museum” of Wales. This is “Free to enter” (but £4 to park a car), and is well worth visiting to help understand what you see around you and the working conditions and culture of the miners. 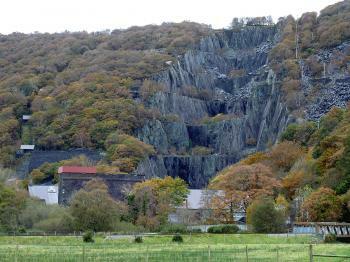 The quarry contained 2 main areas and each has left a giant gash in the mountain face (photo). Up the mountain-side are a series of levelled areas leading to ever higher quarry “faces” which allowed slate to be extracted from multiple levels at the same time. It was reduced in situ to standard size roof slates (men only got paid for "good" finished slates and worked as small teams covering all tasks from initial extraction. They then shared the final payment). Waste was dumped and the slates were moved from each levelled area to “ground” level on rope inclines, one of which has been restored (look for “V2 Incline”). From there it was transported the c8 miles to the port by narrow gauge (2 ft and later 4ft) railway. This has been reconstructed as a “tourist attraction” running alongside Llyn (= “lake”) Padarn but adopting the narrow internal quarry gauge and using reconditioned quarry locos. The faces themselves have become a climber’s “Mecca” offering a wide range of climb difficulty through to some which have only been completed a handful of times. At the foot of the mountain next to the mining museum the lowest levels have become a lake deep enough (18m) to be used as a scuba diving training area. There are numerous walks in the area including some which ascend the quarry by footpath and lead to some quite atmospheric un-restored working areas with rusting equipment which looks untouched since the last miner left it over 50 years ago! Have a look also at the “hospital” dating from 1860 and paid for by the workers’ own contributions – a “mortuary” building is next door! We parked for free at 53.115489, -4.113017 from where there is an attractive 15-20 minute walk to the Slate Museum which provides fine views of the quarry, the lakes and also a chance to visit the 13th C Castell Dolbadarn which was the highly romanticised subject of a painting by JMW Turner. The museum has numerous displays set in the original “rooms” e.g the Workers’ canteen, the largest working water wheel in UK, a foundry etc etc and provides demos of e.g Slate splitting. Although it also has a row of miners’ cottages transported from another location it is not primarily a “skansen” consisting of such gathered examples. It and nearby walks could easily fill 3 hours or more. The other major northern “quarry” identified for inscription is at Penrhyn in the Ogwen-Cegn Valley section (situated south of the Slate mining town of Bethesda - it isn't clear if that town itself would be included). This was even bigger than Dinorwic (“At the end of the nineteenth century it was the world's largest slate quarry; the main pit is nearly 1 mile (1.6 km) long and 1,200 feet (370 metres) deep, and it was worked by nearly 3,000 quarrymen.”) and still employs around 170. Its main “up front” visitor attraction is Europe’s longest and fastest zip wire which travels for over 1 mile over the quarry hole and lake. But there would appear to be some interesting walks as well all the way from (or to) the Slate port of Port Penrhyn, taking in Penrhyn Castle built for the owner of the mine. The structure, built around a 14th C fortified manor house, is considered a particularly fine example of early 19th C “mock Castles” and reflects the monies made from slavery and slate by the Pennant family. You could also take in Bangor University’s Neo-Gothic building from 1911 which seems to be intended for inclusion. But I am not sure it would be worth it – we just looked at on the Bangor skyline. The university was founded in 1885 but its original home has been demolished and its tangible connection to the rest of the site is perhaps a bit thin (E.g this report of the opening of the new building “there was then a procession to the college including 3,000 quarrymen (quarrymen from Penrhyn Quarry and other quarries had subscribed more than 1,200 pounds to the university)”). Instead we travelled south east around 27 miles to the Ffestiniog Slate Landscape. Here there are several more “pay to enter” attractions – the underground mine visit, another (!) zip-wire and an “off road Quarry Explorer” – namely a 4x4 army truck to take you to the top of the quarry. These are not "cheap" - a standard underground tour is £20 though, if you plan ahead and book/take an early one, this price is halved. Even if you don’t want any of this (we didn’t! ), the town of Blaenau Ffestiniog itself is worth visiting. It was only created in the early 19th C and is a “slate town” par excellence, a raison d’etre it is trying to replace with tourism. Around 85% of the population are Welsh speakers. It lacks significant buildings, but still provides an authentic atmosphere with its remote setting in wild countryside within which the grey spoil heaps almost “disappear”. Indeed if one knew the likely boundaries intended for the “slate landscape” there are a number of ghost slate villages in the surrounding hills which could be worth walking to (Cwmorthin looked interesting on a flyer we were given). The T List entry suggests that the narrow gauge steam railway which terminates at the town would be included. This makes its way up the 950ft from the coast at Porthmadog via a twisting route through attractive scenery with regular services provided by authentic steam locos. We didn’t take the train but did stop off at Tan-y-Bwlch station, where “up” and “down” trains pass each other on this single track line, in order to see 2 trains at the same time! The T List entry given to UNESCO also refers to the intention to include the “early hydro-power station”. But why – it only dates to 1963 and its prime factor of interest is that it is a “pumped storage” station? This uses more energy than it creates but it can produce 360 mw “on demand” and thus saves on “peak power” investment. It doesn’t really seem relevant to the OUV of the site? So - what are the chances of inscription? Well, having experienced many of the other “Industrial Heritage” WHS around the World, I don’t see that this one is any less valid – indeed rather the opposite! Slate quarrying isn’t represented at all (Syracuse has significant ancient stone quarries and Italy also has the Carrara Marble Quarries on its T List though it would appear that it intends presenting these also as an archaeological site rather than as an industrial one), whilst there are numerous Silver mines! 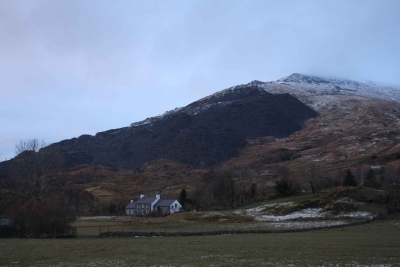 I found the Dinorwic location particularly worthwhile both for its museum, located in an authentic building and other remains, particularly the more remote ones. In common with many UK WHS there is a fair degree of “commercialisation” in the presentation of some of the “experiences” at some locations but I don’t see that these interfere with the overall OUV. The potential nomination has a “Web Site” and this contains an assessment of potential economic outcomes from a successful bid (It is interesting to see what the “drivers” are behind local support for the WHS initiative (i.e Jobs!) but, when I spoke to several “locals” in Blaenau Ffestiniog, none of them was aware of the intention to gain WHS status! I also found the arguments in the report for the potential economic benefits of inscription rather unconvincing – using Vigan as a benchmark hardly seems relevant!) The only time scale info is this quote “A technical evaluation of the bid was presented to the DCMS in November 2015 for consideration by a panel of heritage experts. We received constructive and positive comments on the bid in early 2016 and are now working towards developing and strengthening the necessary documentation with a view to gaining a date from DCMS for final submission of papers to UNESCO.” With Scotland having been successful with the Forth Bridge in 2015, England with the Lake District in 2017 and apparently also pursuing Jodrell Bank for 2019 it would seem that Wales would have a good argument for progressing the Slate Nomination ASAP thereafter.